Thirsty Thursday’s Answering Your Questions! Why do you choose to juice instead of high speed blend? So, I actually high speed blend and juice, but there are a number of reasons why you might want to juice over high speed blend. For people who have chronic illness or intestinal illnesses such as IBS, crohn’s, colitis and celiac, digesting fiber can be a big deal or even difficult to impossible. Juicing gives your digestive system a break and leaves you with extra energy that would have been taken up digesting. 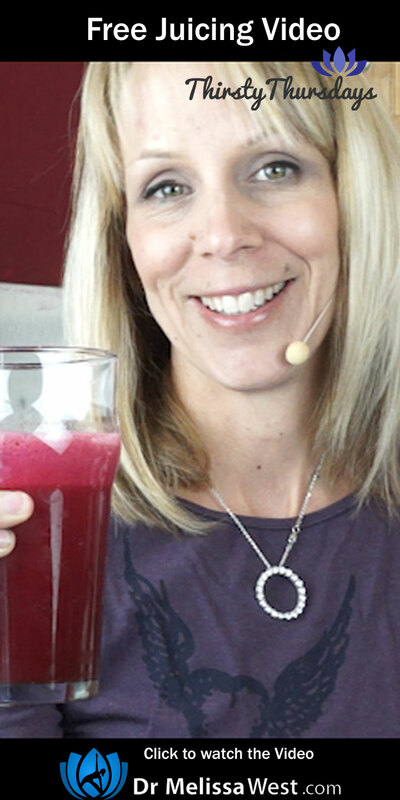 Because juicing skips your digestive system and goes straight to your cells, you save your energy for healing and get lots of nutrients to boot. Bypassing the intestines helps the body rest its digestive energies and heal. For people who don’t tolerate fiber well, juicing is an awesome choice. She wants to know how to get kids to drink more greens in their juices. My trick is to sweeten them up with fruit. My favourite fruits for sweetening are pineapple, (with the rind which has lots of chlorophyll and therefore already green) and oranges, apples are great too. Hi Melissa I have a young friend with hemochromatosis what would you put in a morning drink for her. I would to see her get some relief from her joint pain. By the way I love seeing your drinks in the morning very inspiring I have started my own drinks when I get up. So first of all I am not a medical doctor, so it would be important for your friend to speak with a medical professional to make sure that this juice does not conflict with any of their medical advice or her medications. Hemochromatosis is a disorder where the body can not rid itself of excess iron. The excess iron is stored in your organs, especially your liver, heart and pancreas. Joint pain is very common as Melba said.